This world is an amazing place. There are many natural phenomena that could almost come from a fantasy novel. I’m going to describe some of these for you, focusing on the ‘wow’ factor rather than the science behind them. Links provided show pictures and more info. Most of these can also be seen on YouTube if you search. Perhaps some of these wonders can inspire you. The Auroras (Northern and Southern Lights): This effect is probably the most well-known of those I’m going to mention. Glorious light shows in the sky, green and red curtains of light above the horizon. Known by the Cree as the Dance of the Spirits. 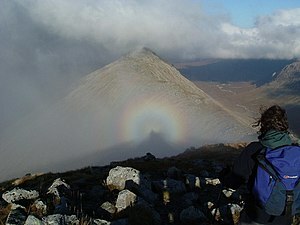 Broken spectre: A rainbow halo surrounding a shadowy figure. Also known as a Glory Ring or Brocken Bow. An effect of light and fog. It seems as if a ghost comes through a tunnel of light. Ball lightning: Balls of light, traveling through the sky. Wrath of a thunder god? Or chariots of fire? No short lived streak of light, but a life determined to continue. Fire rainbow: The sky on fire, wisps of cloud as flame and smoke. A wide rainbow band. “Relámpago del Catatumbo” (Catatumbo lightning): ” Arcs of light in the sky, messages between the clouds, never-ending storm. This almost permanent storm has been used as light for ship navigation, giving it another name – Maracaibo Beacon. The lightning has no thunder, as if you were watching a window into another world. The Rain of Fishes: In Honduras, the Lluvia de Peces, or Rain of Fishes, occurs a couple times each year. A huge storm blesses the people with living fish, inspiring a yearly festival to celebrate the phenomena. A modern manna from the heavens. Pink lake: This is one that inspired a location in my own story, a blushing lake filled with a goddess’ tears. 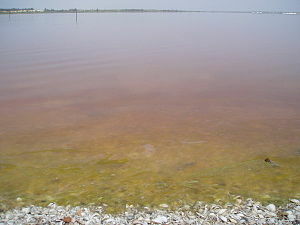 Shallow waters, filled with salt, shimmering shades of pink and purple. Some say that magic is merely science that has yet to be explained. But even those with solid science explanations retain their awe, their magic. Let a little of this world’s magic influence your own.